Audioboom / Monday, April 10, 2017, A Daily Prayer With Bishop Crudup, "Monday Of Holy Week!" Monday, April 10, 2017, A Daily Prayer With Bishop Crudup, "Monday Of Holy Week!" 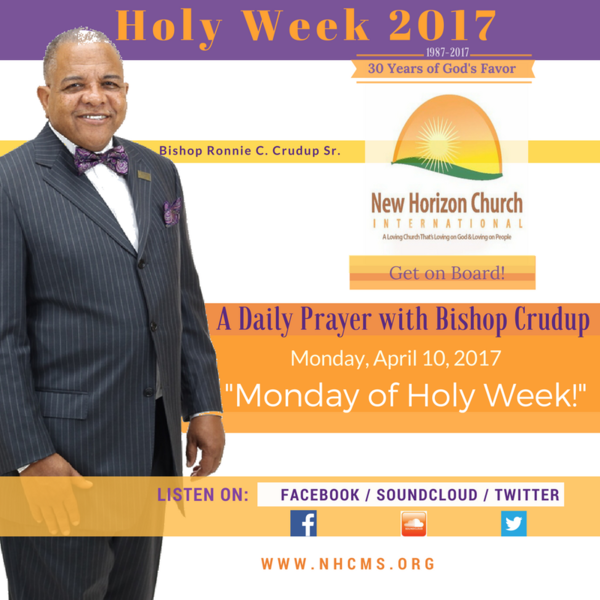 For Monday, April 10, 2017, Bishop Ronnie C. Crudup Sr. offers a prayer of purpose, "Monday Of Holy Week!" Tuesday, April 11, 2017, A Daily Prayer With Bishop Crudup, "Tuesday Of Holy Week!" Thursday, April 13, 2017, A Daily Prayer With Bishop Crudup, "Thursday Of Holy Week!" Thursday, April 20, 2017, A Daily Prayer With Bishop Crudup, "Cause Success To Come!"